This week our featured fanart is “LoZ: Spirit Tracks” by deviantART artist Lo-wah. Well first off, happy belated Valentines Day~ Hope everyone had a good Feb 14th, and in the spirit of Valentines I decided to feature something cute and sweet this week. LoZ: Spirit Tracks certainly fits the criteria of cute and sweet, with its bright and cheery colors and the overall happy atmosphere. The coloring is gorgeous and the background is beautiful. 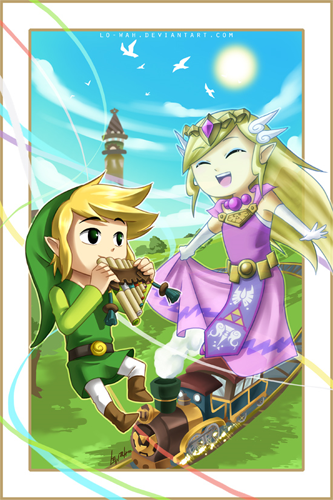 It really portrays the adorable relationship between Link and Princess Zelda in ST. What do you guys think?